While this is not technically a “hike,” to leave this area out of a book on hiking with dogs in Southern California would be a complete shame. To put it bluntly, this is dog paradise. The entire island (except for the private children’s camp) is open to unleashed dogs. 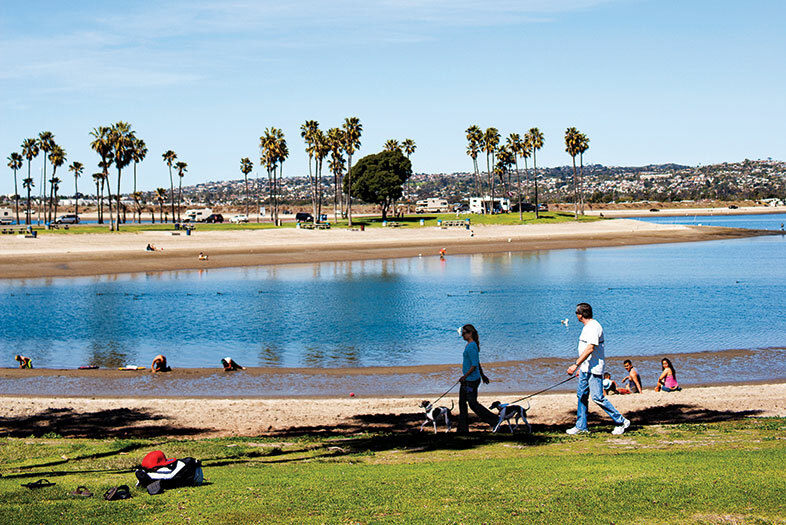 Dogs can trample through the waters of Mission Bay, they can run on the sandy beaches, and they can climb the dunes on the inner part of the island. They can wander through the coastal grasses and other wetland plant life that grows wildly in the interior. There are more than enough smells to keep your dog active, engaged, and happy for a lifetime of enjoyment. Your dog would live here if you let him. Four miles of pavement encircle most of the island. You can vary your hike by spending time in the lonely interior, walking along paths, creating your own or following the roads. Getting there: From I-5 north, exit Sea World Drive; makes a left heading towards the beach and amusement park. Across the freeway, make the first right onto East Mission Bay Drive. There is a sign for Fiesta Island; turn left onto Fiesta Drive. Once you cross the water, you can park anywhere on the right side of the one-way road.